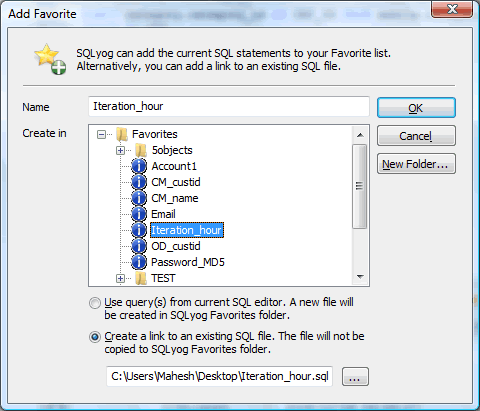 SQLyog allows easy access to frequently used SQL scripts. The script files can be stored as files from the SQLyog interface or you can link to an existing file anywhere where windows can access it - on a local drive or a shared network drive. The SQL scripts and the file links can be organized in folder and subfolders. The number of script files and file links and the number of nested folders you can manage is limited by an Operating System and the File System only. This feature is available from the menu. To add an item you can also use the Ctrl+Shift+F keyboard shortcut. 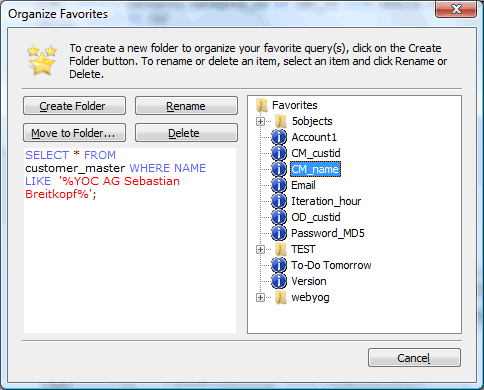 To insert a favorites to the SQL-editor just click 'Favorites' in the menu, navigate to an appropriate folder and click the name of the 'Favorite'. You can manage (organize folders, files and links and delete) your favorites from the Menu -> Favorites -> Organize Favorites. Just click any item and next the appropriate button in the dialogue.